Another good series of races have marked the third weekend of the Italian ACI Karting Championship in Sarno at the International Circuit Napoli that welcomed 200 drivers for the third round of the season with categories KZ2, 60 Mini, and the Rok and Iame X30 Trophies on track with the Junior and Senior grades. Three drivers came to the fore in this round in KZ2: the winner of La Conca Giacomo Pollini (Formula K-Tm) won Race-1 in Sarno, the multiple-times world champion Davide Forè (BirelArt-Tm) secured a victory in Race-2 that launched him towards another high-level season and the young Giuseppe Palomba (Intrepid-Tm) put in a stunning comeback Race-1 before ending on the podium of Race-2 in P2 behind Forè. Among the other strong protagonists of the third round held in Sarno, Maranello Kart’s Marco Zanchetta and Marco Pastacaldi, were on the podium of Race-1 respectively in second and third place behind Pollini. 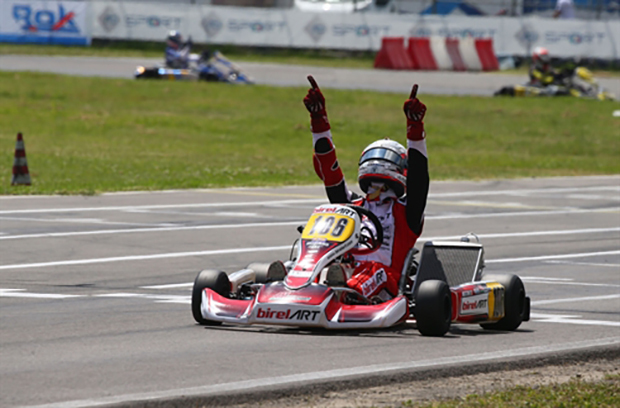 Mauro Simoni (Evokart-Tm) also had a solid weekend and got on the podium of Race-2. Pollini is still the provisional leader of the classification, but reigning champion Zanchetta does not give up and the points hauled with the second place in Race-1 and the fourth in Race-2 (ahead of Pollini), keep him in the title hunt this year too. Palomba was also among the quickest. Some contacts slowed down 2016 Italian Champion Francesco Celenta (Praga-Tm), who was 13th in Race-1 and 7th in Race-2. In 60 Mini, with 83 participants, Andrea Kimi Antonelli (Energy-Tm) confirmed a great competitiveness in Sarno winning Race-1 before fighting for the victory in Race-2. Antonelli proceeded the Belgian Ean Eyckmans (Parolin-Tm) and Jacopo Giuseppe Cimenes (Evokart-Tm) in Race-1. Antonelli recovered then from P8 on the inverted starting grid and managed to close in on the fugitive Norwegian Martinius Stenshorne (Parolin-Tm) engaging in a duel that last until the chequered flag. The victory in the sprint to the line went to Stenshorne, who managed to fend off Antonelli. The British driver Coskun Irfan was third. In Rok Junior, Federico Cecchi (Tony Kart-Vortex) won Race-1 leading Raffaele Gulizia (Tony Kart-Vortex) and Paolo Ferrari (Parolin-Vortex). Morgato inherited the victory in Race-2 after a penalty handed to Filippo Croccolino (Energy-Vortex) due to the dropped front fairing. Gulizia was then promoted second, and Cecchi was on the podium again in third. Senior Rok saw some foreign drivers having the upper hand in this category. The Polish driver Kacper Szczurek (Kosmic-Vortex) won Race-1 from Cristian Comanducci (Tony Kart-Vortex) to Giorgio Molinari (Exprit-Vortex). Formula 4 driver Leonardo Lorandi (Parolin-Vortex) also compete in this category ending eighth in Race-1. After starting Race-2 from the pole position due to the inverted grid, Lorandi had to retire. The victory went to the Russian Alexey Brizhan (Parolin-Vortex), who led Szczurek and Giorgio Molinari (Exprit-Vortex). In X30 Junior, Francesco Pulito (Top Kart-Iame) won Race-1 from Edoardo Ludovico Villa (TBKart-Iame) to Federico Albanese (Tony Kart-Iame), despite an early lead from Luca Bosco (Tony Kart-Iame). A 10s time penalty handed to Villa due to the dropped front fairing allowed Albanese to get P2, as Bosco was third. Pulito repeated his performance in Race-2, putting in a good comeback (from P8 due to the inverted grid) that took him to the victory, this time around from Villa, who was second and Pio Francesco Sgobba (KR-Iame), third, after the fourth place in Race-1. The American Ugo Ugochukwu (Tony Kart-Iame) was fourth in Race-2. The dominator of X30 Senior’s Race-1 was Luigi Coluccio (BirelArt-Iame). The Italian driver did not have an easy life due to the pressure put on him by Marco Moretti and Danny Carenini, both on Tony Kart-Iame, that closed the race behind him. Francesco Pagano (KR-Iame) had the best of all his rivals in Race-2 and fended off all the attacks moved by Coluccio in the sprint to the line. Marco Moretti was third and again on the podium. The next round of the championship will take place at the South Garda Karting Circuit in Lonato del Garda (Brescia), on July 1st with categories 60 Mini, OK, OK-Junior, KZ2, Rok, Rotax on track. Complete results are available at www.acisportitalia.it. TV specials will be shown in the ACI Sport Magazine on RAI Sport, national and about 50 local networks covering the whole Italian territory.